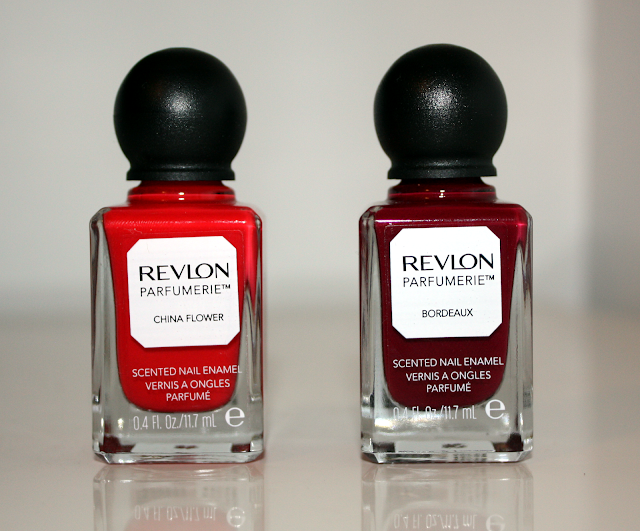 The Revlon Parfumerie nail polishes have been receiving a lot of buzz, particularly due to their adorable bottle. I picked up two colors: China Flower, a vibrant coral and Bordeaux, a deep burgundy red. Scented nail polish is not something that overly appeals to me, certain scents tend to give me a headache and I'd rather smell like my chosen perfume. However, I wanted to try this new line and definitely couldn't resist the packaging. Both colors applied smoothly and achieved opacity at two coats. There was still a slight visible nail line with China Flower, however it wasn't overly noticeable. Pretty colors, smooth and even application, adorable bottle, so what's the down side? Unfortunately for me the down side was the very thing it was marketed for: scent! The polish doesn't smell until it is dry so you can't just open the bottles to smell them at the store. Both polish scents seemed very similar to me. They started off slightly fruity but then quickly turned to an overwhelmingly strong pine/nail polish smell. Even with two coats of top coat, the smell was overpowering. I had to remove all the color off my nails after about thirty minutes of wear because the scent gave me such a bad headache. However, like I said, I can be sensitive to smells, and the friends I gave these to didn't have as bad a reaction as I did. Do I Need This Color? If you're at all sensitive or bothered by scents, then this is definitely one line to avoid. I gave these away because I couldn't stand the smell. However, the bottle is so pretty and they are an affordable line with many colors, so if you can stand the smell these might be great for you!